Two new portraits of the Queen have recently been revealed. Poor portrait painters. Most portraits just get criticized, and praise seems rare. 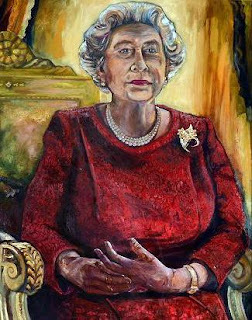 Such is the case with the two most recent portraits of the Queen. The first (above) was commissioned by the Royal Mail - the first time they've commissioned one - to cap a special collection marking the 60th anniversary of the coronation. 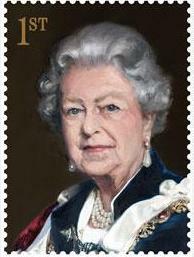 Click here to read more at the Royal Mail's site and here for more on the painting itself. For this painting, the Queen is wearing Queen Victoria's Pearl Drop Earrings and one of her three strand pearl necklaces in addition to her Garter robes. The second was commissioned by the Welsh Rugby Union, again in honor of the 60th anniversary of the coronation. Click here for more. This is your daily Queen look: her button earrings, three strand pearl necklace, gold watch, and presumably twisting her engagement ring. The brooch could be the Diamond Bouquet Brooch, allowing for hefty amounts of artistic license, of course. UPDATE: This is the Daffodil Spray Brooch.